Fringe: The Complete Third Season on DVD: Would You Alter the Future? At the end of Season 3, Peter makes the decision to sacrifice himself thus altering the future. If you were given the opportunity to change the future, would you take matters into your own hands, or would you trust in fate? I just don’t have a good answer for this weeks post! Oh my, dear. As a mother, I would do anything for my children. Having hindsight and knowing the outcome of my daughter Emilee’s birth, it would be incredibly difficult to not change the outcome. If I did so, what would become of the children I have today, though? I love each and every child I have and I just don’t think I could chance how making a single decision differently might change who they are or if they were even in existence. What about you?? 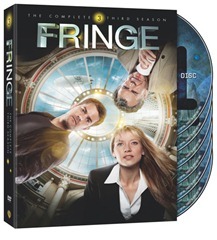 Order Fringe: The Complete Third Season on DVD here today: http://bit.ly/o2MYBv ! I have been hired by Warner Bros. WBWord division to promote Fringe: The Complete Third Season on DVD/Blu-Ray.